I played Monster Hunter World for 4 hours last night and I was blown away by how beautiful the graphics and how smooth the animations are. I don’t own a lot of CapCom games just Street Fighter for nostalgia and Dragon’s Dogma. Playing Dragon’s Dogma has already had me convinced but now CapCom just sealed it for me that CapCom will be a developer for me to follow. Now I’m curious what other PC games they made. Monster Hunter World’s premise is very similar to Guild Wars 2 since both games are about Elder Dragons. From what I have experienced so far, my role is to study the dragons and maybe kill them later. Unlike in Guild Wars 2, we set off to kill them first, then study them later. In my opinion, it is a smart premise to study and research first before trying to destroy something we barely understand. In Guild Wars 2, that rash decision of Destiny’s Edge to destroy the Elder Dragons are now showing unpleasant consequences. So for the Monster Hunter World to take it slow is a sensible approach. It seems that in Monster Hunter World, professions are defined by what weapon I choose — it reminds me of Final Fantasy XIV. Which is curious enough that SquareEnix was advertising Monster Hunter World in FFXIV. Anyway, the game has a lot of weapons. From the fast-paced fighting style of Dual Blades to a slow precision fighting style of Lance. There are two different modes of playing, solo or co-op. So it seems that certain weapons are not good going solo and the starting weapon I choose is proof of that. When I was browsing the weapons, I found the Insect Glaive has two options; damage or support. The damage option is taking a Kinsect that applies poison to the target and the other option is taking a Kinsect that heals. Going solo with the Insect Glaive just takes too long to kill anything big. I just don’t feel the damage is significant enough. Although, I have so much control in combat so maybe I just need to master the weapon. So far, I love the balance using the Insect Glaive even though it is not as fast hitting as the Dual Blades and not as hard-hitting as the Hammer. Now my next experiment weapon will be Dual Blades. This weapon set is practically Demon Hunter in World of Warcraft. This is the weapon that gets into the monster’s face since it has the shortest ranged. I still don’t know how I feel about this weapon because getting close to the monster is never healthy. I’ll have to find out later, I guess. There are many weapon sets includes a shield. 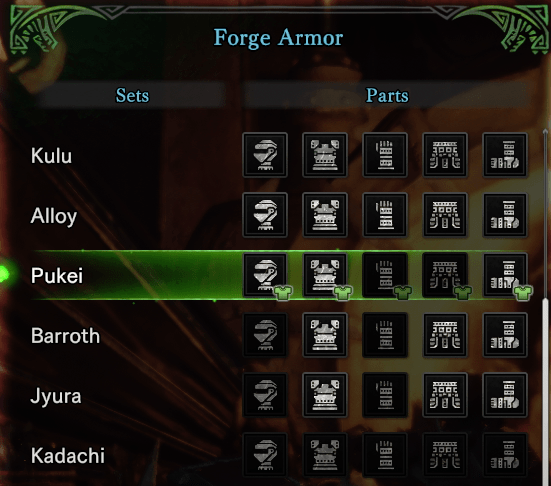 Sword & Shield (duh), Lance, Gunlance, and Charge Blade all have shields. Three ranged weapons; Bow, Bowgun, Heavy Bowgun. Six 2-handers; Greatsword, Longsword, Insect Glaive, Hammer, Hunting Horn, and Switch Axe. Lastly the dual wielding set, Dual Blades. The shield wielders seem too slow for me but it seems it will have more durability and I’m interested in using the Lance…maybe. The range weapons are just boring for me so I’m not touching those. The 2-handers other than the glaive are also too slow for me, although the Switch Axe looks interesting. This only means I have a lot of things to explore. I’ve dabbled in crafting to create a new set of Hunter’s armor and the system is not that bad. The way the set is organized is something I really appreciate. For instance, each set is ordered in a row and each column is the item piece. So if I want to craft all items in the set, all I have to do is select each column within that row. Compare to Diablo 3’s crafting where the set pieces are scattered inside the pull-down list for each piece category which is the same with Guild Wars 2, Monster Hunter’s version is by far the best. Ok this is where the learning curve becomes a challenge. I made a mistake of going out hunting without learning the basics of the weapon I’m using. So yes, I struggled in my first quest but thanks to my Witcher training, I overcome the challenge. As soon as I got back to base, I went to the training area. As a Glaive Master, I wasn’t using Kinsect at all. Yeah, I was banging my head on my desk. In my second quest, I was like, yeah this is easier than not using my Kinsect. I also learned vaulting which has been very useful for mounting the monster. Yes, I was mounting the monster and stabbing it at the back of its neck or between the shoulders. Eventually, the monster falls down in exhaustion (I think) where I can do some awesome glaive combo moves on its face. It is a very satisfying experience. My other quest wanted me to track a flying monster, Pukei-Pukei, but I’m not using a ranged weapon. Then I found out about how tracking works and how to find its lair. So this is getting really interesting for me. I am using a keyboard and mouse and since this is a ported game, the control is not following the standard keyboard control layout. I have to remap a lot of the controls, for instance, interacting is mapped to the right mouse button so I changed it to the standard F-key for interaction, I-key for inventory/equipment, K-key for the skill info, T-key for focus target, etc. After fixing the mapping, the control plays just like any other MMORPG game control. Monster Hunter World is impressively stable the whole time I’ve been playing the game. There are ported games that dislike alt-tabbing that usually ends in crashes. So far, I have not experienced any crash or instability, not even lag. I have not seen any graphical glitch or anything. There is no doubt that this is a high-quality game. I bought the deluxe version of Monster Hunter World only because of it selling for only $56 but I should have just bought the regular version since the deluxe version didn’t really come with cool items. The samurai set is impressive in detail, but the armor design in Monster Hunter is equally impressive. I do not want the armor skin be hidden under the samurai skin, so that item is a bust. All other items I don’t care about. The sale price I paid for the game still made it worth it and hopefully, they will add better skins in the future. Looking at how crazy CapCom can get in the Street Fighter skins, I’m sure they will create impressive ones for Monster Hunter.